It's tough to make cycling any greener, but the Dutch have done just that with a bike lane that powers street lights and even houses. 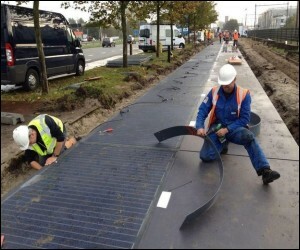 What's being billed as the world's first solar-powered bike path will officially open on November 12 in Krommenie, a town northwest of Amsterdam. Riders will be able to hop on at one end and then, after a few seconds of pedaling, dismount at the other. Being a pilot project, the lane is only 230 feet long (though it'll stretch to 328 feet when finished).